"Do you want the application 'Pycharm.ap' to accept incoming network connections? It's really getting annoying to do this every time, has anyone else got this? I'm on OSX 10.6 (Snow Leopard), and there IS an entry for PyCharm in my firewall telling it to "Allow", but I still get the pop up every time I start it.. Which version of PyCharm are you running? Did you install any additional plugins (in particular LiveEdit)? Same here - updated to 2.6.2 and I get this message every time I start PyCharm. Tried to manually add PyCharm to the Firewall list of programs allowed to "accept incoming network connections" but that doesn't help. Same problem here with 2.6.2. 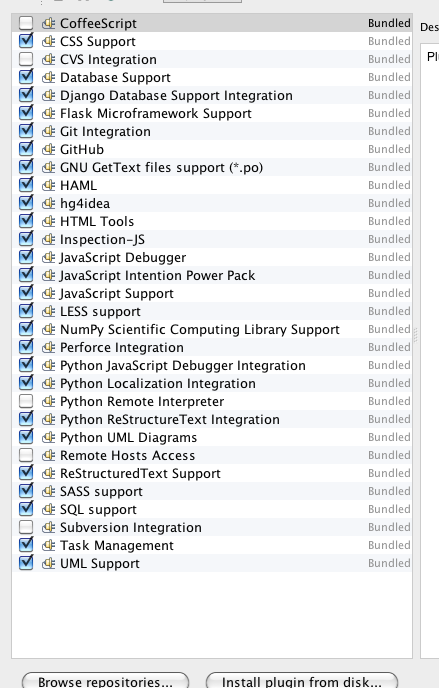 Only using subset of bundled plugins on Mountain Lion. Manually adding PyCharm to firewall does not resolve problem. We have found the reason of the issue: our patch-based upgrade breaks the code signing that Mountain Lion relies on. Until this issue is fixed, please download and install a complete distribution of PyCharm for every update. Thanks for the quick response, Dmitry. That worked perfectly. Thanks for the help, and hopefully you can get it working with updates again too. Hi Dmitry, that didn't work for me. I'm on 10.6.8, PyCharm 2.6.3. I downloaded the complete distribution of PyCharm and installed it, replacing the old one. But I still get the message "Do you want the application 'Pycharm.app' to accept incoming network connections?" Did you get it just once, or do you still get it on every startup? Hi Dmitry, thanks for your reply. It happens on every startup. Hi, I'm also running in to this issue. It's a brand new install of PyCharm on a brand new install of Yosemite. I tried uninstalling completely and reinstalling, but still run in to the popup continually asking to allow incoming connections whenever I start PyCharm. Add me to the list - I've just moved to PyCharm 4.0.1 on Yosemite and indeed, I am getting it also. I wasn't getting it on 3.4.1. And me, also on Yosemite, freshly re-installed PyCharm 4.0.1. Here are some steps that demonstrate, and perhaps will help the PyCharm folks reproduce. Notice the "a sealed resource is missing or invalid" after first launch, in step 6. 2. Download fresh PyCharm 4.0.1 Professional from Jetbrains site, and drag-install as directed. 4. Now launch PyCharm. Approve the "downloaded from internet" dialog. Notice no firewall complaint. 7. Launch PyCharm again. Now (and until you reinstall) you'll get the firewall access dialog. I had the same problem when running Django from PyCharm: the popup would appear at each reload. I realized that my Run/Debug configuration had the Host value filled with 0.0.0.0 (making the test server accessible from the local network). This is what caused the issue. I've emptied the Host field and I don't have any permission popup anymore. So now I have two Run/Debug configurations: one for hot reloading while coding (Host empty), one for testing my API through local network (Host 0.0.0.0) which does not require hot reloading.